I imagine, like many apps users, I had seen the “form” option on the new document menu but never got around to using them. I had assumed it was intended to automate basic forms with functionality commonly used within an office – e.g. annual leave form, expense form etc. To some extent I was right – it can do all these things, but like all of the Google Apps, the real power of forms comes with leveraging the power of the Internet and gathering information from outside your domain – your clients, your partners. This article is about the surprising level of functionality provided by this “forgotten” App and how it can be used easily to capture and analyse information. Google Apps forms can be used for customer surveys, evaluations, feedback, events, registration/subscriptions management or just about any situation that requires you to get some data back from someone. 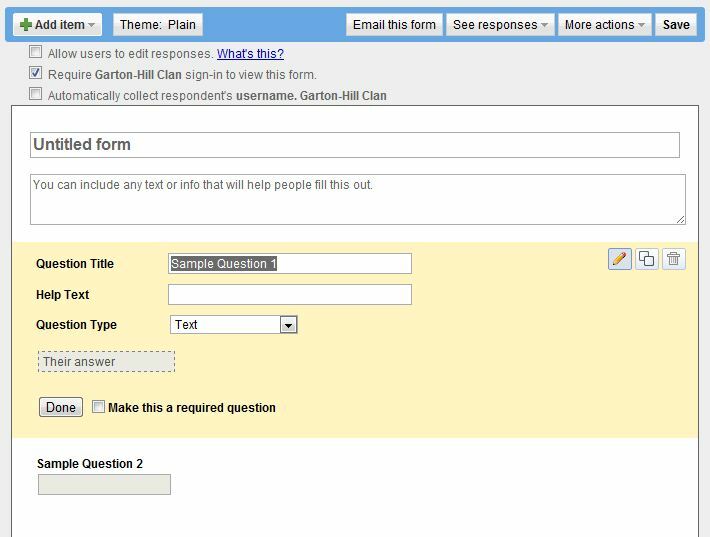 The basic principle of Google Apps Forms (as for any paper form) is to extract information from someone for later analysis and/or storage. 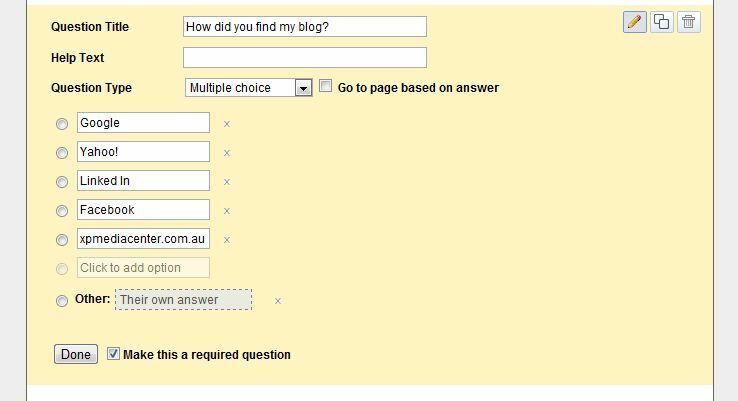 The idea of electronic forms has been around for a while and just about every website lets you add comments or send an email using an electronic web form. Traditionally, these forms would be designed and implemented by the web site maintainers and would capture information in a basic format – like an email – that could then be massaged into a usable format before being analysed. 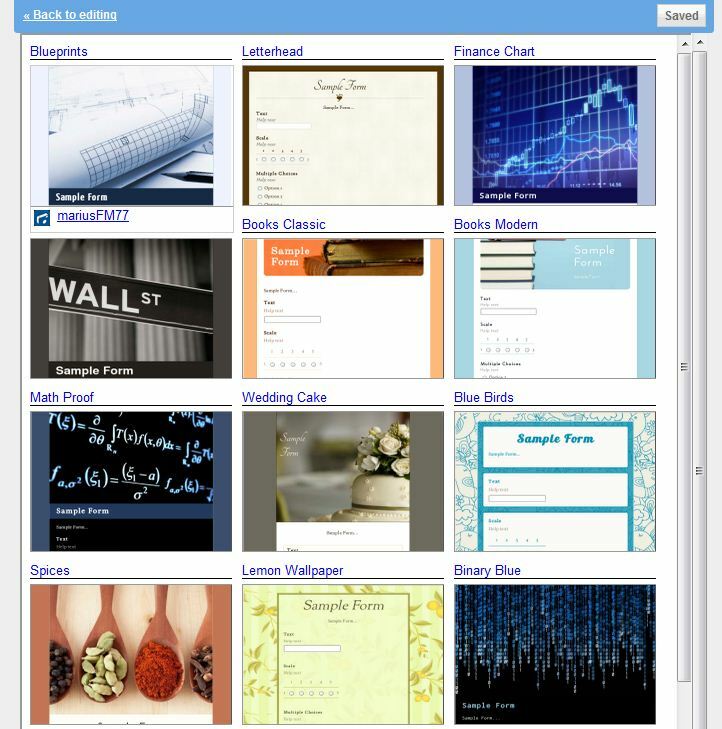 Google Apps Forms are different as they are integrated into the apps suite and are intrinsically attached to a spreadsheet. Data returned from a form is automatically stored as columns in a spreadsheet – which makes the data reporting and analysis much easier. Creating a form is simple. Inside Google Apps, selecting Create New | Form from the main interface will present you with a simple WYSIWIG workspace containing the form name, a text box and the first two “controls”. 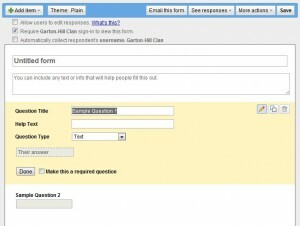 The form name is what everyone will refer to the form as and is shown at the top of the form to all users. Give it a logical name e.g. “Course Evaluation form”. Under this is a text box allowing you, as the form designer, to provide instructions to people filling out the form. You might want to explain why you are doing this and how the data is to be used and who to contact if they have problems/concerns. Under this is the first of the two controls. Clicking on a control allows you to edit / delete / duplicate it. To add new controls you click on the “Add item” menu button – duh! You can move controls up and down the form by dragging them. As all the fields are arranged vertically down the page, you are essentially limited by design to grouping and placing the fields in the order that you want. You can mark any or all of the fields ‘required’ or ‘optional’. Fields can also be pre-filled with sample or example data or from an outside source. The adding and customising of controls is very straightforward so I won’t go into details here. When you have finished your form design you can save it. When saved, the form will actually appear as a spreadsheet in your document list under the name of the form. To open the form for editing or deployment, you need to open the spreadsheet document and select the required option in the form menu item. Its important to note that regardless of which deployment option is chosen the data is collected in the same spreadsheet. To embed into a website Google gives you a line of code to include in your HTML. I tested it with this WordPress blog and it works fine. The only thing I had to do was override the margins so it would fit in my page theme. Google provide a load of themes (95 of them at at the time of writing) that allow you to customise the look of your form. At this stage it does not seem possible to make you own theme. Responses are stored live into the linked spreadsheet so you can watch your responses come in in real time if you want (and follow up if needed). The responses can be automatically summarised into nifty charts and graphs. And of course all the standard features of Google Apps spreadsheets – including sharing with others and exporting offline to PDF and excel etc. Once again with forms, Google have provided something with great utility that is easy enough for anyone to use and deploy. However it is worth noting some of the more obvious limitations in its current form. For starters, in the text response fields, there no validation of what the user has entered – other than they have entered SOMETHING. For example, if you want a date (e.g. date of birth) you have no control over what is entered is in the right format – or even a date – same if you expecting a number. Another nifty thing would be user customisable control over the submit button so you could redirect the user to another page (or another form even) once they complete the form or depending on their response. But for now, given its another “free” feature of Google Apps I am very impressed. The “Contact Ben” form on this site is a Google Apps form. I will leave it there as long as it does not get spammed too much.